In the coming fiscal year (July 1, 2018–June 30, 2019), the Rheumatology Research Foundation has committed to fund more than $9.4 million in rheumatology research and training. Approximately half of the awards will support efforts to recruit and train the next generation of rheumatology professionals. The remaining funds will be awarded to advance research projects that lead to breakthroughs in treating people with rheumatic diseases. In all, the Foundation has committed more than $161 million to fund more than 3,400 awards since 1985, making it the largest private funding source of rheumatology research and training in the U.S.
ACR Leaders to Talk Policy with Congressional Leaders in D.C.
Across the U.S., Foundation awardees are focused on improving the lives of those affected by rheumatic disease. Although the focus of their work varies, investigators. such as Jeffrey Sparks, MD, MMSc, Maria Dall’Era, MD, and Liana Fraenkel, MD, MPH, are changing the future of rheumatology. Many patients with RA have an increased risk of infection due to the disease itself and the immunosuppressants often prescribed to manage rheumatic diseases. Research indicates that respiratory complications are a major contributor to the excess morbidity and mortality for patients with RA. Although treatment can successfully regulate many aspects of RA, including infection risk, understanding the risk and its outcomes could lead to prevention of infections for people living with RA. Foundation-funded investigator Jeffrey Sparks, MD, MMSc, and his team at Brigham and Women’s Hospital, Boston, are addressing this issue. Dr. Sparks has developed predictive algorithms for factors associated with pneumonia and to identify patients at risk for recurrent pneumonia. 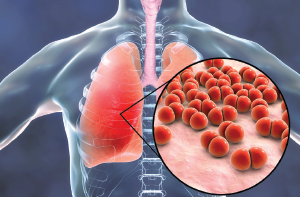 Pneumonia is both common and serious in people with RA. During the entire course of RA, 10–20% of patients will experience at least one episode of pneumonia. Some patients have multiple episodes of pneumonia and have a particularly high risk of poor outcomes, including mortality. The algorithms developed by Dr. Sparks help predict and identify RA patients at risk for pneumonia and recurring pneumonia. Ultimately, he hopes to develop interventions to decrease the risk of pneumonia and mitigate outcomes that occur after an episode. Dr. Sparks’ work is benefiting patients, researchers and physicians by providing new avenues for identifying and improving outcomes for patients at risk for pneumonia. A passion to improve the clinical reasoning skills of future doctors led Maria Dall’Era, MD, to create a tool that has the potential to address the growing shortage of rheumatologists by exposing medical students and new doctors to rheumatology.